How do I put my ring on and take it off? 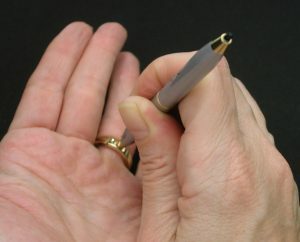 Hold your CLIQ stylus close to the tip and press directly into the dimple. Place the ring around the base of your finger. Using your thumb and index finger, press the ring top and bottom together until you hear the CLICK- letting you know your ring is secure. To remove: Position the hand palm side up and turn until the dimple is centered. Press directly into the dimple. Once the latch is up, pull the top or bottom of your ring to open fully- DO NOT pull on the latch. Absolutely! We’ve been making rings CLIQ for almost 25 years, and when you hear the click of confidence, you know your ring is on securely! My ring has details or diamonds on the sides and bottom of it! Can you make it CLIQ? Your jewelry is as unique as you are. Our mission at CLIQ is to make your rings fit perfectly- any ring, any style! It’s important to us to maintain the design of your ring! It’s best to discuss the specific details with a jeweler in your area. Find them here! Because CLIQ rings fit the base of your finger and open completely, you need to be sized at the base of your finger. Check out our Jeweler Locator to find a jeweler who can help you find your TRUE finger size. What if I don’t hear the “click” when I close my ring? Any mechanical object needs to be properly maintained. Just like your car needs to be inspected annually, your fine jewelry needs to be inspected every 6-12 months. 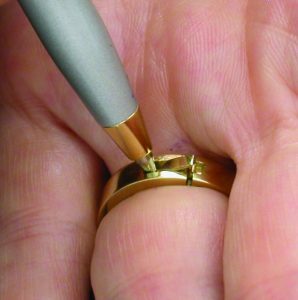 Take your ring to an authorized dealer and it will be inspected and adjusted to ensure that it is functioning properly. 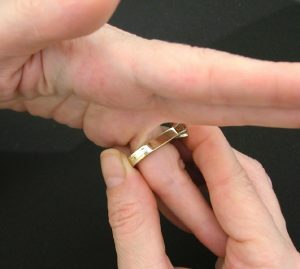 If you do not hear the click, that is a sign that your ring needs to be adjusted. What if I don’t have my stylus? Your CLIQ stylus is specially engineered with a resin tip that will protect the polished finish of your ring. 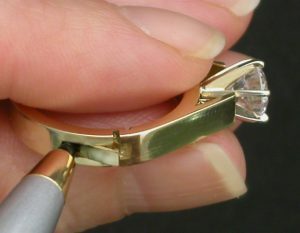 If your CLIQ stylus is not available, a ballpoint pen or a toothpick can be used to remove your ring. You are never stuck in your ring! You can always get a few extra styluses here. What if my size changes? No problem! Generally, our bodies gain and lose mass around our joints and knuckles, so the base of your finger will likely never drastically change in size. In the event that your need to have your ring size adjusted, see your authorized dealer. I haven’t been able to wear my ring! Can you make my ring CLIQ? ABSOLUTELY! We can make any ring CLIQ-it will sit comfortably and beautifully at the base of your finger! In 1993, when we first invented our patented technology, we were born as Superfit. Over the years, the audible “click” of confidence became our signature, and we reintroduced ourselves as CLIQ Jewelry. Our rings still feature the same trusted technology, backed by the same family of experts with a modern and refreshed name. Can I get CLIQ outside of the United States? Certainly! CLIQ is available internationally. Wherever you are, we can make your ring fit perfectly!